SocialistWorker.org journalist Danny Katch is the author of a new book that is an entertaining and insightful introduction to what the socialist tradition has to say about democracy, economics and the potential of human beings to be something more than being bomb-dropping, planet-destroying racist fools. Here, we print an excerpt from “Ghost Stories,” one of the opening chapters of Socialism…Seriously: A Brief Guide to Human Liberation. A ghost is haunting the United States–the ghost of socialism. All the old powers are united in their aim to eliminate this demon: Presidents and preachers, Hillary and Rush, Wall Street CEOs, and NSA spies. Where is the Republican who doesn’t claim that his Democratic opponent is a socialist? Where is the Democrat who doesn’t run away screaming from this horrible accusation? 1. Socialism is widely seen by the One Percent as a threat to its rule. 2. It’s about time that socialists should openly make our case to the world and replace the boogeyman version of socialism with a declaration of what we’re really all about. A spectre is haunting Europe–the spectre of communism. All the powers of old Europe have entered into a holy alliance to exorcise this spectre: Pope and Tsar, Metternich and Guizot, French Radicals and German police-spies. The Communist Manifesto might be the most influential book in the history of the world, if you don’t count the ones about God or teenage wizards. Within months of its publication in 1848, revolutions broke out across Europe. Terrified elites thought that the two young authors must have immense powers, either to prophesy uprisings or to create them. In fact, Marx and Engels had no idea that 1848 would become a historic year, but they did know change was in the air because they had been spending a lot of time with pissed-off workers, which was and still is an unusual habit for intellectuals. People in Paris, Berlin, and elsewhere didn’t rise up that year because Karl Marx told them to. But after they had taken to the streets, the Manifesto provided some of them with a vision about what their revolt–and future ones–could achieve. This has been the aim of socialism ever since: to demonstrate how the courage and creativity that people already possess can point the way toward a different society that will be built on those qualities rather than be threatened by them. The United States in 2014 is a long ways away from 1848 Paris. I don’t expect the publication of this book to trigger another American Revolution (although, wow, that would be great for sales). Yet the opening words of the Manifesto still resonate because we too are haunted. Unlike the European upper crust that Marx taunted for being frightened of a socialist future, today it’s ordinary people who are scared of the future that capitalism seems to promise. IT WOULD be one thing if the world had a lot of problems but things looked brighter on the horizon. People can put up with almost anything if they think that someday their kids won’t have to. Besides, who doesn’t like a good fixer-upper project? But the scary part about the past few decades is that things are clearly getting worse. According to the global charity Oxfam, the eighty-five richest people in the world have as much wealth as the poorer half of the world’s population. Put another way, each of those fuckers owns as much as forty-one million other human beings, which is more than the population of a midsize country. The cruelest kings in history could never have dreamed of this level of greed–one man can only have so many fine tapestries and jewel-encrusted crowns! In history class we were all taught the comforting doctrine of progress: Horrible things happened in the past, like slavery and the Black Death, but the world is now a more gentle and enlightened place. Yet it is in this world today that more than seven million people die from hunger each year, even though it has never been more obvious where to find the money that could save them. Then there is war. Growing up in the 1980s, I thought wars were bad things that countries used to do before they realized how idiotic they were. Needless to say I wasn’t aware that even then the United States was involved in coups and covert military operations all around the world. But now we’re back to straight-up old-fashioned wars that never end–in addition to coups and covert military operations all around the world. I could go on with examples of increased racism, sexism, and other supposed artifacts from the Bad Old Days, but most of you have the Internet. You see the same things I do: the police murders, the campus rapes, the vile comments at the end of the articles about the police murders and campus rapes. The ultimate way to measure how we are moving in the wrong direction is with a thermometer. Global temperatures are rising, glaciers are melting, and coastal cities are flooding because of carbon emissions from oil, gas, and coal. That’s bad enough, but what’s worse is that the response of those in charge to the existential hole that humanity finds itself in has been to literally keep digging–for more fossil fuels. In 2014, the United States announced–in triumph instead of shame–that it had become the world’s leading oil producer. The future of all life on this planet is losing to the short-term opportunity for a few people to make even more money. This fact alone should make the case against capitalism a no-brainer. DECLARING CAPITALISM to be unfit to serve humanity, however, does not automatically prove that an alternative will be any better. In fact, it is commonly assumed that socialism has been proven a failure over the last century. Some of this is convenient propaganda for defenders of the status quo, but it is certainly true that neither the “communist” dictators of Russia and China nor the mild “socialist” reformers in Sweden and France succeeded in creating the liberated democratic societies that Marx and Engels described in the Manifesto. As a result, many people who are turning against capitalism do so with the assumption that socialism is also a dead end. But socialism is the only viable alternative to this society that anybody has ever come up with, which means that anti-capitalists who reject socialism are reduced to vaguely calling for the system to be replaced with…something better. This doctrine of “something better-ism” can unite people for a time against what they don’t like, but it isn’t so great at pointing a positive way forward. Despite what you sometimes hear, young people today care about the world and protest as much as any previous generation. In the years since the banks crashed in 2008 there have been uprisings in country after country, from revolutions in Tunisia and Egypt to Occupy Wall Street and police brutality marches across the United States. The key difference between now and the sixties is not that our marches are smaller, but that they project less confidence that we can make a better world. As badly as capitalism is screwing things up, we are not sure that we could do a better job. Therefore we are haunted–whether we know it or not–not only by the future horrors of capitalism but by the past failures of socialism. In one of his later books, Marx writes that the defeats of generations long dead weigh like a nightmare on the brains of the living. Yes, that’s right. Karl Marx even predicted the current glut of zombie movies. And yet despite everything, socialism is making a comeback. Polls show that socialism is more popular than capitalism among some sections of the population, which is an incredible development. Even though many people would agree with Homer Simpson’s memorable declaration that “in theory communism works–in theory,” they can also plainly see that capitalism is not working–in reality. But because few people have ever had the opportunity to learn what socialism means, much less be involved in a socialist organization, the word can mean almost anything to the left of slave labor camps. Of course, this is in part due to the Republican habit of crying socialism at unemployment insurance, environmental regulations, and any other policy based on the idea that government programs should extend beyond bombing and jailing. I’m surprised some right-wing freedom lover hasn’t yet held a press conference to declare traffic lights a Big Government conspiracy. 1. Working people control the government. 2. The government controls the economy. 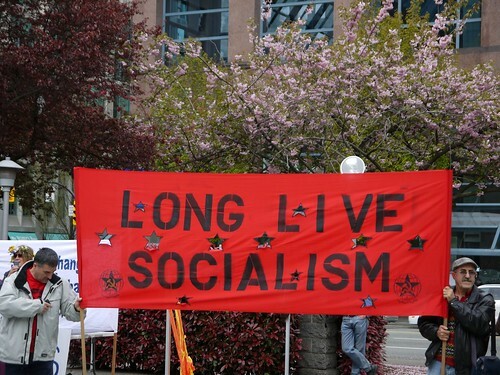 Number 2 has been the main feature of countries that call themselves socialist or communist, but without Number 1–without democracy at every level of society–state control of the economy has nothing to do with socialism. Karl Marx, Vladimir Lenin, and Rosa Luxemburg were all freedom fighters living under kings and dictators. They were socialists because they concluded that full democracy was impossible under capitalism. By democracy, they didn’t mean having a vote on one day in November, but taking an active part in all of society’s important decisions. Because we are so used to picturing the masters of both government and economy as narrow centralized powers that rule over us from a handful of buildings, it is hard for us to picture changes in society that go beyond replacing the people in those buildings with others who are hopefully more honest and noble. Socialism wouldn’t just replace those people but the system that centralizes so much power in a few buildings. It would broaden the bases of decision-making to thousands of buildings and public squares and community centers. It is a system in which the people control the government by changing what government means. ONE WAY to think about socialism is a society where there is no world outside of sharing our skills and imaginations. Imagine an Occupy Wall Street that is a thousand times larger and based in our workplaces and communities. Occupy Health Care would be nurses, technicians and other medical staff, doctors, and patients taking over hospitals and clinics and deciding how they should be run. Occupy Our Food would bring together farmers, slaughterhouse and factory workers, and dieticians, ecologists, and vegans to debate out a safe, sustainable, ethnical, and enjoyable system for feeding ourselves. Soldiers on the front lines of this country’s endless wars would form De-Occupy Everywhere and refuse to carry out any more deadly missions. This type of radical participatory democracy is the heart of the socialist vision. Long before there was Occupy, there were soviets. That’s a word you may recognize from Russia’s former official name–the Union of Soviet Socialist Republics–but you probably don’t know that it means workers’ council. Before it lost its socialist character and became a dictatorship, the Russian Revolution was led by democratically elected soviets. These local bodies sprang up in factories, military barracks, and peasant villages across the country to conduct the revolution in their local areas and elect delegates to the regional and national soviet government. “No political body more sensitive and responsive to the popular will was ever invented,” wrote the great socialist journalist John Reed. As with the Paris Commune, delegates to the soviet could be voted out immediately by unhappy voters. Housewives, domestic servants, and other working people who didn’t labor in factories could organize themselves into bodies and gain representation in the soviets. Only employers and police were excluded. Every shop and cafe had an inscription saying that it had been collectivized; even the bootblacks had been collectivized and their boxes painted red and black. Waiters and shop-walkers looked you in the face and treated you as an equal. Servile and even ceremonial forms of speech had temporarily disappeared. Nobody said “Señor” or “Don” or even “Usted”; everyone called everyone else “Comrade” or “Thou,” and said “Salud!” instead of “Buenos dias.”…And it was the aspect of the crowds that was the queerest thing of all. In outward appearance it was a town in which the wealthy classes had practically ceased to exist. Except for a small number of women and foreigners there were no “well-dressed” people at all. Practically everyone wore rough working-class clothes, or blue overalls or some variant of militia uniform. All this was queer and moving. There was much in this that I did not understand, in some ways I did not even like it, but I recognized it immediately as a state of affairs worth fighting for. You may know George Orwell as the author of 1984 and Animal Farm, which are taught in many schools as anti-socialist propaganda pieces. But Orwell himself was a socialist, who rejected dictatorships that called themselves communist, but recognized and supported the real thing when he saw it. The socialist revolutions in Russia and Spain didn’t last. Neither did Occupy Wall Street. But that doesn’t prove that the task of socialism is impossible any more than the history of dozens of failed slave insurrections proved that plantation slavery would never end. 1. “Communism” and “socialism” used to mean the same thing in most contexts for Marx and that’s how I treat them in this book. We’ll get back to this question in chapter 9. 2. The quote is from The Eighteenth Brumaire of Louis Bonaparte about the 1848 revolution in Paris. It’s a tough read if you don’t already know the history, but with some background information it’s one of the sharpest and wittiest histories of a revolution you’ll ever find. 4. The idea that companies always hire the right managers is obviously false. Funny how this isn’t used against Marx more often by defenders of capitalism. 5. This is from Nathan Schneider’s “Thank You Anarchy.” I’m less grateful than Schneider to anarchism, but I’ll get into that in chapter 9. 6. Those who participated in Occupy Wall Street also know that we would have to imagine a version of the movement that created more effective structures for making democratic decisions. 7. If that sounds far-fetched to you, check out a book called Soldiers in Revolt: GI Resistance During the Vietnam War by David Cortright. 8. John Reed is played by Warren Beatty in the epic movie Reds. Sometimes I dream there’s an epic socialist movie about me, but it always turns into a rom-com with a horrible name like Guess Who’s Commie to Dinner? And I’m played by Zach Galifianakis. This entry was posted in All Posts News Politics and-or Videos, Capitalism, Politics, Revolution, Socialism and tagged Book or Film Reviews or Excerpts, Class Warfare, Danny Katch, Inequality. Bookmark the permalink. One irony has been overlooked by both sides of the argument. Conservatives are always crying that Rome was undone by this or that immoral characteristic of Roman society — abortion-on-demand, say. One thing you NEVER hear conservaties mention is the modern historians’ consensus that Rome was undone by a combination of factors. One of the most significant was the concentration of wealth. Another was political corruption. . . .
Deke, I suggest you read Prof. Michael Parenti’s “The Assassination of Julius Caesar” from a different perspective of why he was murdered. Upon returning to Rome from his numerous military victories, he told the “1%” they needed to share the wealth and help the working-class, the farmers, et al, which was viewed unfavorably by the Senate and the ruling-elite, so they conspired to kill him. Parenti had the book authenticated by two scholars of Roman History, an American and an Englishman. It’s a fascinating read, and documented as best as it could be from that long ago. Seems to me it was, like, 500 years from the murder of Caesar to the collapse of Rome in the west. . . . The other thing about it is that I personally think Julius Caesar was the greatest general who ever lived and would have made a great dictator on the Plato’s model of “philosopher king”. I also think “The Gallic Wars” is the greatest book ever written. And don’t you tell me about Michael Parenti. I know he’s a socialist and I’ve been reading him for years. Too bad for all of us he’s getting old and won’t be around much longer. Neither will I for that matter. Parenti’s life of Caesar is right near the top of my ‘must read’ list. I don’t understand what the death of Caesar has to do with my charges against human nature. Seems to me human nature (greed and power lust) is what motivated his killers. Better go lecture somebody else. You either have a chip on your shoulder or completely misunderstood my post, and it’s almost not worth commenting on. I agree that Julius Caesar might have been the greatest general of all time, especially during the Gallic Wars. On Michael Parenti, he’s been a hero of mine for many years and for that matter, I’ve purchased more of his books than those of any other scholars and mentioned his book on Caesar as an addition to your comments on Rome.Take it for what it’s worth. Offering and sharing information that,others may not have is not “lecturing” to somebody else, sir. Perhaps you should work on your rudeness when replying to somebody else who responded in a positive tone. No need to reply as this conversation is over. You’re right. I realized I’d made a mistake when I reread your post. I was hoping you wouldn’t be too badly hurt. I see you’re a guy who can take it on the chin and hit right back. That’s a good thing, and you have my apology for making a stupid mistake. Thank you for the clarification. It happens in email correspondence all the time. Actually I wasn’t hurt at all but wondered why you misconstrued the mention of the Parenti book on why Caesar was killed. Glad it’s cleared up. Well, over the years I’ve become accustomed to people throwing rocks at me whenever I confess to having read something by or agreeing with Michael Parenti. When people I don’t know start talking to me about Michael Parenti, I black out and brace myself for what typically follows. Parenti is NOT popular in America, as you know. Nobody ever heard me say a word against Michael Parenti. I myself have been a fan since I read “Inventing Reality” back in ’86. I haven’t read every word he published in the interim, but I read his stuff when I see it here and there. They put him up on Counterpunch every now and then, as I recall. I don’t know if he ever gets into The Nation because I don’t read The Nation at all since Katrina Van den Heuvel took the helm. But when I see him and when I’m in the mood. The whole truth is that stuff I read for reviews gets most of my reading time. The corpus of H. L. Mencken gets most of the rest. Then there’s the fact that I HAVE to write. Parenti isn’t the only one who can’t get his op-eds published in the mainstream. I had to put up a blog to see my own work in print. So every town in America should elect a soviet. And every member of every local soviet can be replaced by the people of the locality, always acting democratically. And all of the soviets in, say, Iowa will elect representatives to the state legislature and the legislature will coordinate the soviets and the soviets (membership in which can change at the drop of democracy’s silly hat) will lead local citizens to — um — perdition, I think. If you truly believe you can make such a system work, you are out of your mind. What you don’t seem to realize is that the forces arrayed against the success of your socialist system do not consist of hostile ideologies but of human nature itself. Human nature is the same force that turns capitalist societies into greedy monstrosities. The practice of socialism will turn formerly hard-working people into sneaking, thieving, self-serving, criminal idlers. If you don’t believe me, try a 4-year hitch in the military. I recommend the Marines, but you can pick any branch you please. I have no love for capitalism as it’s practiced in the United States. I agree there has to be a better way. But utopian socialists are as badly deluded as utopian capitalist adherents of Adam Smith. There has to be another way. I liked this a lot, and I’d like to buy a copy of the book — but I prefer to only buy books in electronic form, not on paper. (I could argue about that preference politically, but let’s just call it a matter of personal taste and leave it at that.) I don’t see any electronic versions available. Will one be available soon? Thanks. I saw that link earlier, but it didn’t work for me. I had forgotten that a lot of web pages with forms don’t work for Firefox on a Mac. It works fine on another browser. Glad you got it to work. Didn’t know Firefox didn’t work well on Macs. I use Firefox but on a PC. What a pity that this article is so long. There is nothing wrong with socialism – at least all of us would be equally poor. With capitalism however, this equality vanishes – the rich get richer and we, the 99%ers, continue equally poor. Well, Vera, it is an excerpt from a book, so it’s good that it is long.